Bitz, M. (2014). Amazing comics. Educational Leadership, 72 (1). Bitz, M. (2010). Manga and the motivated high schoolers. Sequential Art and Narratives in Education (SANE) Journal, 1 (1), 1-22. Bitz, M. (2009) “Manga is my life”: Opportunities (and opportunities missed) for literacy development. Harvard Education Letter, 25 (4). Eek! Comics in the Classroom!. This article describes many of the benefits of using comics and graphic novels in education and also includes resources for places to find appropriate materials for class. Comic Books in the Classroom. This news story outlines why comic books may be a great way to promote reading in reluctant readers as well as help teach writing, emotions, and more. Comics in the Classroom. Take an in depth look at the recent trend of using comics in the classroom, whether it is appropriate for the classroom, and resources for teaching with comics and graphic novels. Should Graphic Novels Be Required Reading? Comics in Education is a website run by Dr. Glen Downey for the purpose of sharing activities and ideas for using comics and graphic novels in literacy education. Head to the classroom section of the site to find five literacy skills development activities that can be completed online or offline. Those activities include wordless narratives, graphic poetry, cave art, visual note-taking, and symbolic language in words and images. In the classroom section you will also find curriculum connections and explanations of the rationale for using comics with all students. Make Beliefs Comix Fill-ins "You supply the words to complete this book! This do-it-yourself comic e-book provides a place where you can give MakeBeliefsComix characters your own words and thoughts. In this comic book, unlike any others you’ve read, you’ll get to decide what happens and have the final say. All you need to do is just follow the prompts and fill in the talk and thought balloons to determine what characters say and think." Make Beliefs to Spark Your Writing "When you read this book, let your mind roam to new places and ideas and express all the wonderful things that are within you. All you have to do is fill in your responses to the magical questions asked by the characters from MakeBeliefsComix.com. For example, make believe someone discovered a note that you placed isparkn a bottle that washed up on the beach. What would it say? " Character Analysis: Have your students choose a favorite character from a favorite story and re-write that character into a comic strip story. In their stories students should attempt to demonstrate how their chosen characters would act in a different situation than is described in the original story. Thought Bubbles on Photos thought bubbles on paintings or photos. Thought Bubbles ask kids to imagine what the people in the image are thinking.Start by finding a photo or painting depicting an event, idea or group of people that helps introduce your content. I used the famous Emmanuel Leutze painting of Washington crossing the Delaware as my starting point. click to see an example. Re-telling of historical events: Have your students create short comic strip stories about significant historical events. For example, students could create comic strips about Alexander Graham Bell inventing the telephone. The comic strip could have scenes of Bell working in his laboratory or talking to friends about his invention. Create alternative book reports: Rather than writing a book report have your students create three to five frame comic strips covering the key parts of books they've recently read. Express feelings: Creating comic strips can be a good way for students to re-tell a situation that made them feel happy, sad, or mad. The use of facial expressions on comic characters is a nice way for students to express their feelings even if they don't write much within the scene itself. 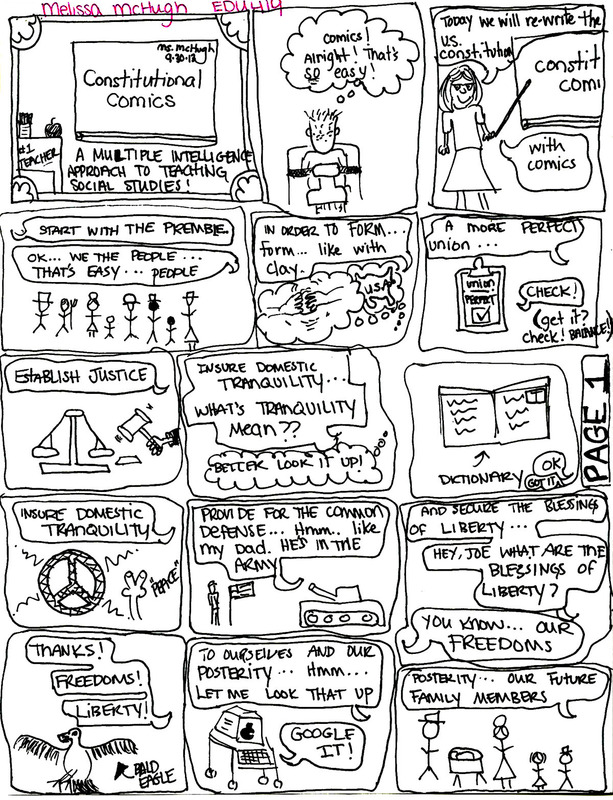 Constitutional Comics first take a look at the example version of the NH constitution article 83. Make a Statement. Students take a position on the politics during the American Revolutionary War and convey their stance through several different mediums, including comics. Making Inferences with Comics Lesson 4th - 5th Help the students understand the concept of summarizing non-fiction text. Selena: Science Comics This colorful site offers science comics, educational interactives, links for teachers, and more. Engage students with these comics, and encourage them to identify the scientific principles found in each. Follow up activities include word searches and other puzzles to reinforce vocabulary. Use the "For Teachers" link to find pdf lesson plans for ideas and experiments that coordinate with the comics. This site was created in Great Britain, so you may notice some slightly different spellings that US English. Educational Comic Books in the Classroom Besides comics to read, you can publish free your comics and get ideas from other student comic projects. Flummery This page has links to some great resources on teaching using comics. It also has links to lesson plans and classroom activities using cartoons. Thoughts About Comics #2 My Comics Classroom. This teacher describes the value of comics in his fourth grade classroom. Comic Book Science in the Classroom. Listen to this NPR report about teaching with comics, including both benefits and concerns as seen by educators. Comic Books in the Classroom. The New York Times takes a look at the value of using comics in education and the success of The Comic Book Project. Comics in the Classroom. This informative article examines some of the reasons why comics and graphic novels are fast growing in school libraries, but a bit slower to reach the classrooms. Digital Comic Museum (DCM) is a free resource platform where users can easily download public domain golden age comics without the need to ask or worry about searching the net for them. These comics are organized into different categories. You can for instance browse collections by last updated or most popular or you can search for comics by name. Pixton Unlimited panels, saving and comic novel options. Powerful character manipulation options. StoryTop ( K -4) is a web-based tool for creating digital stories and comics. StoryTop features an easy-to-use drag and drop tool for creating your story. To use Story Top simply select your background, characters, and text bubbles from the menu and drag them into your story box. After selecting the basic story elements you can then add additional elements like plants, animals, and vehicles. When your story is complete you can save it in your Story Top account or send it to friend. Take screenshots of each panel to paste in a document. Toony Tool, which can be used to create a comic-like scene. Students can add preloaded backgrounds, characters, thought bubbles, props, and meme text to their scenes. Storyboard That Extensive artwork with flexible attributes. Free version limits the panel selection up to six, but you can utilize screen shots instead of saving to create as many panels as you want. NEW feature is the special characters option in the virtual keyboard which you access above the text box when you insert speech bubbles (video). Can save and revise. There is also the capabilities to download, prints, embed in Webpage and save as Powerpoint. Free e-book The new guides provide great ideas for teaching Macbeth, Romeo & Juliet, and The Great Gatsby with storyboards. Each of the guides include a set of essential questions, alignment to Common Core standards, and templates for character analysis. The templates also include ideas for using comics in which students analyze the elements of plot in each story. characters or create your own from extensive body parts and objects. Excellent tutorials. Various panel configurations. only One character per panel. You can revise after saving, print and embed in a webpage. Play Comic Comic activities (games) These activities help students focus on different elements of comics, e.g., narration, plot, character development. Students complete comic templates. Capability to save and edit. Make Beliefs Comix also offers a multilingual comic strip creation service that makes it easy to get students started developing comics. Through Make Beliefs Comix students can create comic strips online without needing to register on the site. Watch my video below to see how easy it is to use Make Beliefs Comix.Make Beliefs Comix. Make Beliefs Comix now offers nine free ebooks of writing prompts for use with elementary and middle school students. All of the ebooks are fillable PDFs that students can write in on their computers or download and write in by hand. The free ebooks are just one part of what Make Beliefs Comix offers. Pikistrips Free, well-designed software that lets you create comic strips from photos and save them for others to view. Write Comics is a free, simple tool for creating comic strips. Write Comics doesn't require any registration to use. In fact, registration is not even an option. To create a comic on Write Comics just select a background from the menu, choose some characters, and add some speech bubbles. You can continue adding frames until you've completed your story. Write Comics is quite easy to use, but there is one short-coming and that is the only way you can save your work is to save it to your local hard drive. Comic Strip Creator is self publishing free software that allows you to create and export your own comic strips in jpg format. Write Comics (2-6) very simple to use to create comic strips. Multiple panels, saves as a link that you can download or print. Speak Up is a straightforward cartoon-creator site meant to teach the importance of character, setting, problem, and solution. The site provides possible characters, settings, and conflicts from which students can choose. Creating cartoons is an effective way to teach students how to write stories with a clear storyline and structure. The story problem section allows students to write in their own scenarios. Students are responsible for creating the solution to the story problem themselves. Each cartoon strip contains six boxes, allows two characters per page, and speaking bubbles as well as narrative box across the bottom of the page. Chogger Create comics online by creating original art or uploading pictures to your comic strip. lets you draw your own comics, caption photos, take webcam pictures and upload pictures and add speech balloons. More creative options than using stock art work. Add speech or thought bubbles and quickly publish a finished product. 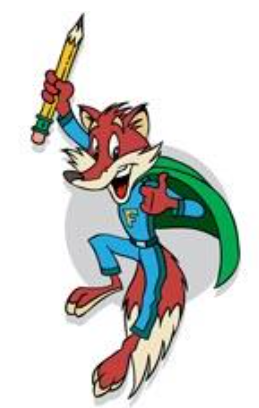 Super Hero Squad invites kids to create their own super hero comic strips and comic books. The Super Hero Squad provides users with templates for comic strips and comic books. Completed comic strips and comic books can be downloaded and printed. Limited number of female characters. ZimmerTwins Gr. 1-3 - Create cartoon movies. Must create account to save. SuperActionComicMaker you can create your own super comic hero and tell your story with him. Manipulate characters' actions. Email link to print. ToonyTool is a free website for quickly creating single frame comics. You can easily upload panels to a slide show or doc. When you're satisfied with your comic you can download it, print it, and or share it on social networks. ToonyTool does not require an email address or any kind of site registration in order to create comics. In that regard it is a good option for students who don't have or don't want to share their email addresses with yet another service. A good tool for quickly creating comics to use in slide presentations or to attempt to summarize a concept in fun and simple graphic. Goosebumps Graphix: Nice layout templates and variety of graphics. Sample comics. You can print but not save. print and save, but not revise saved comics. Marvel Kids create super hero comic strips and comic books. Marvel Kids provides users with templates for comic strips and comic books. Users select the backgrounds, characters, and special effects from the provided menus. Limited female characters. After creating their scenes, users can add dialogue boxes to their comics. Completed comic strips and comic books can be downloaded and printed. Turn Your Pictures into Cartoons Be Funky ; Create Amazing Classroom Photos and Convert to Cartoon are simple to use and do not require a sign up Now you can let your students use their own pictures and turn them into cartoons to create dialogues and storytelling lines . Befunky is quick and simple tool for transforming digital photos into instant art work or digital comics.Extensive range of effects, speech bubbles, accessories, graphics and lot’s of objects that you can add to your pictures. Phrase.it allows you to add speech bubbles and some basic Instagram-like effects to your pictures. Now you can upload and work with multiple images in the same Phrase.it project. To use Phrase.it just upload a picture and choose a speech bubble. Drag your speech bubble into place then type your text. You can change the font style in your speech bubbles. Click the "add more drama" button to add one of four image shading effects. When you are done adding text and drama to your images click the "preview and save" button to download a strip of your pictures. Speechable Add a captivating or informative speech bubble to a picture from your computer or that you find (legally) online. Comic Head The app makes it easy to create comics even if you don’t have any drawing skills. To create comics on Comics Head you simply choose a template then add a background, characters, and speech bubbles from the art galleries. You can mix and match the backgrounds and characters as much as you like until you arrive at the perfect combination for your story. Comic Maker HD This is another great iPad app for creating comics. Using simply drag and drop and an intuitive editor, students can easily create expressive comics to share with others. Some of the main features provided by this app include:’layering function to combine images, text, backgrounds into one storyline; 42 pre-made page layout templates along with option of portrait/landscape mode and paper size; pre-made image gallery with various characters at your disposal; fully gestured functions to zoom in, zoom out, rotate, resize, drag-drop image, text, draw objects;support export comic file to other formats for sharing: PDF, PNG, JPG and many more. Cookie Next Door is a sandbox to experience the creative play of story telling by being a co-creator and voice actor in an adventurous tale. The kit includes a creative comic book, voice over studio and animated stage projector. Creative Comic Book: Storyboards are perfect training wheels for imaginative minds to learn the story telling experience. Unlock pages, sound effects and other surprises as you create dialog, sound effects and narrate each frame. Voice Over Studio: Tell the tale. Become the narrator and voice actor of the unfolding drama. Record your voice and hear your speech magically transformed into a cast members of the tale. Animated Stage Projector: Once you complete your story, experience it as a play projected on moving screens with dancing props to highlight the action. Seedling Comic Studio Combine your own photos with custom backgrounds to create and share comics. Comic Life - 4.99 Probably the most popular digital comic iOS app for creating comics. This is a very fun and easy to use app for telling the story by creating a customized comic. Toon Boom Condorito for creating a digital comic. This is a great app that can be used by students for digital storytelling and to learn the different parts of a story. Not only can a user add clip art, text, draw/paint, but they can make the comic move as well. A finished story can then be shared on networking sites (FB, YouTube) or sent via email. Prisma, (IOS App) turn photos into stylized artworks based on different artwork/graphical styles. So if you’ve ever wanted your bedroom to resemble a rotoscope animation, or your selfie to have shades of manga, or your hopeless sketching skills not to hold back your yearning to create a web comic then Prisma is definitely the app for you. Friendstrip add captions to photos for comic effect or cartoon editorials allows kids to get creative by using their own photos to make a comic strip with over 80 scenarios that can be fully customized. FriendStrip Kids makes it easy on the user to build a comic by showing what stance a kid needs to make in order to complete the comic. After that, kids can throw in a few items on the screen and have their own special comic strip that features them! Sketch Me Turn your photos into drawing, cartoons or sketch images in one click to create instant works of art. 19 effects easy to use with full control. <="">StoryMe lets you design personalized comic strips from your own photos. Create beautiful framed collages with speech bubbles and captions – then apply a unique cartoon filter! Turn individual images into a story in seconds. Zoodle Create and publish your own comic strips on the iPad with Zoodle Comics! When you are done creating your comic strip, preview it using multiple layouts, then save it or share it with your friends and family. Save the resulting comic strip to your photo album or share it on Facebook. Comic Puppet Lite Create comic panel with the option to switch people faces for the cartoon characters. Save and revise. Perfect Captions use this app with primary source documents, but it’s also perfect for reinforcing literacy skills. Have students create captions to record their predictions, to jot questions that they have, or write dialogue for the main character. XnSketch allows you to take pictures on your iPad and turn them into cartoons or add sketch effects to your pictures. You can also use the app to affect the color saturation and clarity of your pictures. Comic Touch Lite Make your photos come alive by giving them the Comic Touch. Add balloons to give your subjects thoughts and words. Add captions to describe the scene or give the photo a title. Comic Maker HD Design your own comic easily and quickly with various layouts, characters and much more. You can save, edit and revise. Draw, use built in clip art and/or upload your own photos. Comics Head 3.99 The App is an easy to use self publishing tool and can be used to create storyboards, fun stuff, even business presentation or art! If you have an idea you can instantly create visually interesting content on the go. Get started quickly by choosing from our many templates and inbuilt art assets. Go viral with your ideas by sharing on Facebook, Twitter or email. You can also print them using AirPrint! With the Lite version, you can only save as an image and not revise. Paid version ($3.99) you can save, edit and revise. Bitsrtips allows you to turn yourself into an expressive cartoon character. You can Choose from thousands of customizable scenes, plus new ones daily and add photo backgrounds to your comics and make the possibilities truly endless. Comic Puppets Lite “Comic Puppets Lite provides all the tools to better express your creativity. Comic Master create comics in the "graphic novel style" Comic Master provides a drag and drop interface for students to build their comics on. Students can create free accounts on Comic Master to save their works and edit them whenever they like. Comic Master gives students the option to print multiple page stories. Four character with varied poses. Limited number of props. Toon Book Reader (gr. !- 5) Read cartoon books online using this interactive site. Choose from one of six cartoon books. Choose to read the book in English, Spanish, or French and navigate through the pages using the left and right arrows. Use the "Start Over" button to begin again or click "Read To Me" to hear audio of the pages. Using Comics and Graphic Novels in the Classroom. Understand how using comics and graphic novels can help teach complex reading skills, punctuation, outlining, paragraphing, and literary terms. LESSON PLANS for graphic novels Lesson plans are related to reading graphic novels. My So Called Secret Identity This groundbreaking, narrative comic just might catch the interest of your older students not so thrilled with reading. Cat is a new "superhero" who is not the typical superhero female we see in other comics. She is a police officer's daughter working on her PhD. She is ordinary in every way except her intelligence and her powers of observation. These and her knowledge of Gloria City, where she lives, give her an advantage over the terrorists and other super heroes who also live there. Usually when you think of the super-heroine you picture a gorgeous, shapely woman in tight spandex. Not so for Cat. She is depicted as a college student and "regular" girl, and could certainly be a good role model for the older female student. The art work in My So Called Secret Identity at first appears simple. But on a closer look you realize the details that bring this comic to life! This comic is accompanied by a "Lookbook" where you can learn about the artist's thoughts about the characters and how they should be portrayed. America In Characature 1765 - 1865 This site, by the Lily Library of Indiana University, features the wry wit and artistic talents of America's best political cartoonists. Three distinct and turbulent periods in American history are represented: The Revolutionary War, the War of 1812, and the Civil War. Especially notable are the political cartoons from election years 1860 and 1864. Challenge students to think about how these caricatures compare with those found in today's newspapers. AMU Cartoon Reprints This site is a searchable archive of cartoons (both comics and editorials) available ONLY FOR USE IN THE CLASSROOM. It's a wonderful source of discussion starters and topical humor, but please read the copyright information carefully. Government and social studies teachers will find the editorial collections particularly interesting. 500+ Political Cartoons & 100+ Editorial Cartoon Lesson Plans The Library of Congress hosts an online collection of more than 500 political cartoons and caricatures from U.S. History. You can search the collection by keyword and image type. Along with the images you will find links to related resources from the Library of Congress. You could use these public domain works to help students understand the political perspectives surrounding significant political events in U.S. History. A good model for political cartoon-based lesson plans can be found on Cartoons for the Classroom. Lessons and Activities These sites have lesson plans and activity ideas for analyzing political cartoons. Includes information on the use of symbolism in the cartoons and links to many examples. Dr. Seuss and WWII We all know Dr. Seuss, but how many know the important contribution he made to political commentary during World War II? The Dirksen Collection This archive of political cartoons focuses on those featuring Everett Dirksen, but in so doing, presents commentary on a large number of important political topics during the time period. The Beast Academy book series is a full math curriculum for grades 2‑5. Beautifully illustrated Guides offer engaging math instruction, while Practice books include hundreds of problems and puzzles that reinforce the concepts learned in the Guides. In the full-color, comic-book-style Guides, four monsters attend classes at Beast Academy, where they grapple with math concepts and work together to solve problems. This fun way of learning mathematical concepts is perfect for educators to supplement their curriculum or parents to use at home as additional support. You know how when you walk into a comic book store, all the new issues are spread out on the walls or the shelves? Well, when a blind person walks in, they can’t see anything. The experience in Comics Empower, the comic book store for the blind, is reversed: The blind can see everything on the page and you can’t see anything. The site features original comics available in audio only, podcasts where sighted and blind people discuss their experience reading the same comic, comics written by blind writers, and more! Classical Comics’ main aim is to make classical literature appealing to all. To do this, they offer graphic novel adaptions of classics, from Shakespeare to the Bronte sisters to Bram Stoker. Each title has multiple versions: original text, plain text, and quick text, making it possible for every level of reader to enjoy these beloved stories. AMP! Comics for Kids is a line of paperback graphic novels aimed at middle-school readers. These fun novels range from a series adapted from Beowulf, Kid Beowulf, to the Big Nate series and many more. The site, in addition to offering a plethora of graphic novels, also offers teaching guides catered to each book, so that educators, librarians, and parents can capitalize on their student’s interest in comics. Diamond Book Distributors has put together a comprehensive list of books that their publishers produce that can be used in a Common Core aligned curriculum. Broken up by grade level, this compilation is a great place for teachers to find resources for a classroom and parents to find age-appropriate texts. Scholastic’s imprint Graphix publishes graphic novels specifically for children and teens. They focus on creator-driven books that bring exceptional art, rich content, and strong storytelling to realistic fiction, memoir, fantasy, and more. Supported by librarians, teachers, and most important, kids, Graphix titles have become bestsellers around the globe and continue to receive awards and critical acclaim including multiple Eisner Award wins and nominations, a Stonewall Book Award Honor (Drama), a Boston Globe-Horn Book Award Honor (Smile), an Edgar Allan Poe nomination (The Lost Boy), and 20 New York Times bestsellers to date. Face Value Comics has created the first comic book hero with autism. Intended for autistic readers, this series of comic books is conscious about the social implications of their comics and aim to increase autism advocacy through comic awareness. Their comics are kid-friendly and a non-profit organization, dedicated to bringing children the best in comic book entertainment. A regular Pop Culture Classroom collaborator, Action Labs Comics is one of the companies on the cutting edge of the digital age. In just four years, the company has grown to be one of the most popular publishing houses in the medium and is home to more than a dozen titles including the hugely popular all-ages fantasy Princeless, the Kickstarter-backed mini-series Fracture, and the original graphic novels Exo-1 and the Rock-Solid Steelbots, Back in the Day, and Monsters Are Just Like Us. Action Labs was also one of the first publishers to release a digital comic for Free Comic Book Day, unleashing Action Labs Confidential in 2012, a 200-plus page extended preview of every book the company has released. With origins deeply rooted in the Franco-Belgian tradition of Bande dessinée, Toon Books promotes its books as the first high-quality comics designed for ages four and up. The idea for the line came to legendary designer and publisher Françoise Mouly when her son was learning to read. Appalled by the lack of educational appeal, she instead turned to French comics. Mouly is also married to cartoonist Art Spiegelman, who famously said, “Comics can be a gateway drug to literacy.” Over time, Mouly developed her own methodology for ensuring appeal and quality, vetting every book with educators and testing out rough drafts in schools. In addition to publishing popular titles like Barry and Penny, the Toon Books website offers free online learning tools for students and educators and unique online tools like the free “CarTOON Maker,” and the Readers Theater, which teaches educators how to get students to perform TOON stories. With nearly a decade of experience under their belts, the creative minds behind Papercutz Graphic Novels have succeeded in keeping alive the spirit and presence of some of the world’s most popular characters including The Hardy Boys, Nancy Drew, Power Rangers, and many more. Dedicated to publishing great graphic novels for all ages, the company has engaged a wide variety of writers and artists including popular favorites like Scott Lobdell, Jill Thompson and Jeff Parker, as well as wide-ranging and eccentric talents like Rick Geary, Joe R. Lansdale, Gahan Wilson, and Peter Kuper. While their lineup focuses often on humor, the publisher also delves into experimental mediums including the popular Classics Illustrated line, the pop culture parody Papercutz Sclices, and English translations of popular Franco-Belgian comics including the ever-popular Smurfs. What time is it? It’s always Adventure Time at KaBoom! Studios, the all-ages imprint of the popular Boom! Studios, headquartered in Los Angeles, California. This imprint is a spin-off from the long-time arm Boom Kids! and covers some of the most popular fictional universes in the comics world including The Muppets, Disney, Pixar and Peanuts. Launching in May of 2011, KaBoom! first hit comics stands with a Duck Tales mini-series composed by notable videogame designer Warren Spector and has since captured kids’ imaginations with the Adventure Time series written by Ryan North of Dinosaur Comics, new adventures set in the world of Ice Age, and is planning a comic book adaptation of Pendleton Ward’s Bravest Warriors. Presented by the venerable School Library Journal, “Good Comics for Kids” is a collaborative blog covering kids’ comics written by a group of librarians, parents and writers. The blog was founded in 2008 with the goal of covering kids’ comics for readers from birth to age 16 with breadth and depth through a mix of news, reviews, interviews and previews, written with enough accessibility to appeal to both casual readers and serious comics fans. Recent interviews have featured a wide variety of creators including such luminaries as James Kolchaka, manga artist Misaka Rocks, and indie artist Paul Pope and Jeffrey Brown. This invaluable site covers everything from picture books to Banned Books Week with verve, insight and clarity, providing a terrific resource for parents, kids, and fans alike.